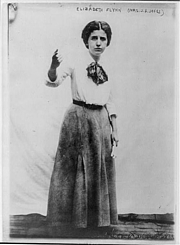 Elizabeth Gurley Flynn was a leading American union organizer, women's rights activist, and Communist. She called herself "The Rebel Girl" in her 1955 autobiography; she inspired famed songwriter Joe Hill to write a song about her by that name. She also wrote another two dozen books, many of them aimed at women. Elizabeth Gurley Flynn is currently considered a "single author." If one or more works are by a distinct, homonymous authors, go ahead and split the author. Elizabeth Gurley Flynn is composed of 3 names. You can examine and separate out names.